Our Designer Series Pole Docks, the cornerstone of On the Water Designs, are hand crafted by experienced welders using the highest quality Canadian materials at our factory in Muskoka. Each section utilizes marine-grade aluminum framing and stainless steel fasteners to ensure a completely rust free design. Decking choices include Western Red Cedar, Solid PVC or Aluminum. 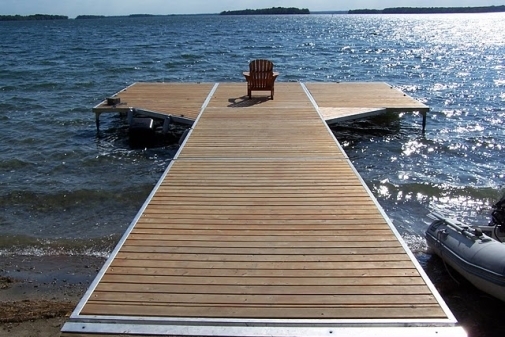 A Designer Series Pole Dock from On the Water Designs makes a very durable and elegant centerpiece to any waterfront. Designer Series Pole Docks come in a wide variety of standard sizes including 4′, 6′, 8′ & 10′ wide and 10′, 15′ & 20′ long. Custom sizes and designs allow for additional flexibility where needed. All frames include decking support stringers every 16″ allowing for almost any choice of decking both now and in the future. Our exclusive deck panel clips clamp decking securely to the frame. 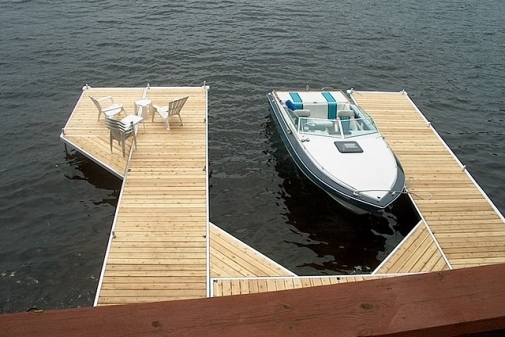 Tired of carrying your wood dock in and out of the water each season? 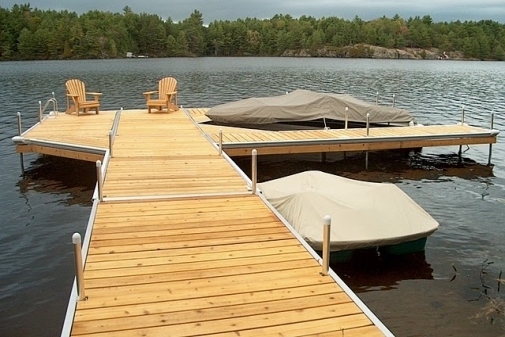 Our aluminum dock systems are up to 75% lighter than your current design. Our modular deck panels allow each section to be removed individually. Most of our dock frames can be lifted by just 2 people or may be wheeled or floated with optional accessories.